Todd Elliot Entertainment provides top quality professional wedding, event, festival and live ceremony and cocktail harp music. We cover all of Southern California providing the best ceremony and cocktail music with our fabulous harpists. We serve Los Angeles, San Diego, Orange County, Santa Barbara, Palm Springs, and any cities in between. Check out more information below! We have many different packages and prices available depending on your needs. We have other unique ceremony and cocktail musicians upon request. A harp at your wedding or special event will play a big part in making your Wedding Day-Event beautiful and unforgettable. It will look gorgeous, sound heavenly, and inspire glowing comments from your guests. 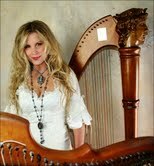 Our harpists are professional and very experienced with weddings and events. Our musicians are devoted to the magic of the harp, delighting the audience with a varied and distinctive repertoire, including music from the Baroque, Classical and Romantic periods; traditional Hebrew and Christian melodies and an expansive selection of contemporary favorites.The harp is an excellent beautiful instrument played for Weddings, corporate events, recitals and any other occasion. Our harpists take pride in delivering a high standard of performance, with impeccable presentation, while maintaining a reliable and friendly approach.